Our new Alpine cab series is designed to fit most makes and models of older tractors. Call us for more details and to find out if this is the right product for your application. This enclosure consists of a steel framed glass windshield, a steel roof with acoustic headliner, and partial (upper) steel side and rear panels. The upper side and rear panels can be configured with glass windows (hard) or soft vinyl curtain inserts (soft). The enclosure is bolted together. Lower half of enclosure is soft vinyl. Door is made of soft vinyl material with clear vinyl window inserts. Door includes a zipper for opening and closing. Front and rear wiper kits are NOT included in the base cab but may be added as optional accessories (1700-2205S works with either the front or rear windows of this enclosure). 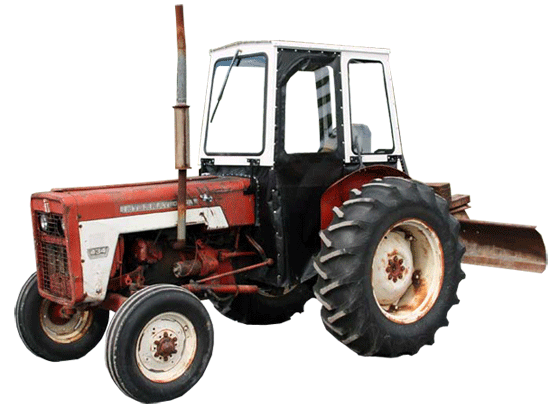 Customer is responsible for fitting enclosure to your tractor, including but not limited to cutting vinyl, installing fasteners, and performing modifications in order to mount and adapt the various enclosure components to your particular tractor make and model. Generic mounting brackets are supplied, but these may need to be modified to fit your application. Currently this cab is offered with your choice of a hard glass window kit for sides and rear or a soft (clear vinyl) window kit for the sides and rear. The soft door and soft vinyl window sections are held in place by velcro and snaps, which are easily undone for quick removal when desired. This Cab DOES NOT work with a 4-Post ROPS. Cab can be quickly and easily removed for summer operation if desired. From your quote page, you can Click here to visit our product detail page for more information. Please see "Data Instruction Sheet" in the documentation section of this page to download the fit-up and dimensional instructions for the Alpine cab.